I come to You in Jesus' Name. I don't want to perish. I want to have eternal life. The Bible says, "If you confess with your mouth that Jesus is Lord and believe in your heart that God raised him from the dead, you will be saved" (Rom. 10:9 NLT). I believe in my heart that You raised Jesus, Your Son, from the dead. And I confess Him as my Lord. Therefore, I am saved. I have eternal life. If you prayed that prayer, welcome to God's family! We would like to give you some materials to help you in your new life with God. Email us at PartnerService@rhema.org or call us at 1-800-54-FAITH (543-2484). God wants Christian men to show the world His character. 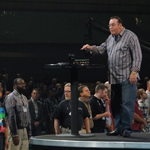 And Kenneth W. Hagin's A Call to Arms Men's Conference was about building that character into those who came. Men from across the United States and other countries were encouraged, challenged, and equipped to have true godly character. Kenneth W. Hagin urged the men to keep their word, even when it hurts. André Butler reminded them that God will help them every day to live pure lives. Todd White challenged the conference attendees to keep their relationships with God their first priority. And workshop speakers shared practical ways to walk out Christian manhood in day-to-day life. Powerful worship and ministry, great food, new friends, relaxing times at the gym . . . all were part of this conference. I enjoy getting up each morning listening to praise and worship music, spending time with God, and receiving His instructions as I get ready in the natural. I was carrying on my daily routine recently when I was abruptly interrupted. Just as I finished putting on my makeup, the lights in our house flickered and went off. That wasn't unusual, and at first it didn't alarm me. "They will come on quickly," I thought. But after waiting five minutes in the dark, I realized this wasn't just a flicker; it was a power outage. 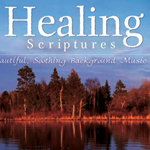 Essential Truth: Healing is God's will for you. Sickness and disease belong to the enemy. Healing belongs to you. Some Christians who need healing have said to me, "Maybe God put this sickness on me for some purpose." Did Jesus ever put sickness on anyone? When people came to Him for healing, did He ever turn even one away saying, "No, it's not My will. Just suffer a little longer. You're just not pious enough"? "There comes a time when we have to let go of the issues that frustrate us." Many of us are familiar with the parable of the prodigal son. It's recorded for us in Luke 15:11–32. Usually people read this passage of Scripture and think it's about a backslidden person who rededicates his life to the Lord. While that is true, there is a lot more to the story.